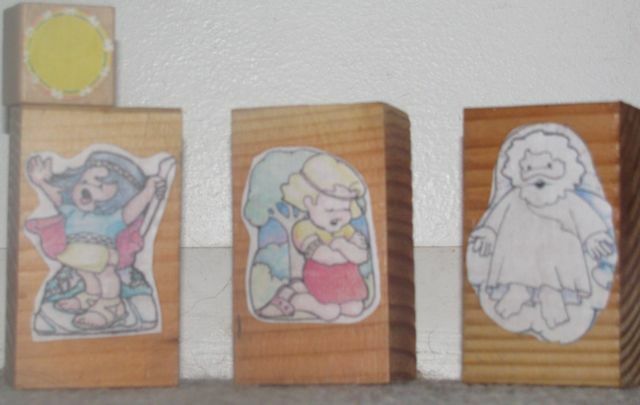 About a year ago I came across this post on DIY Nativity blocks and I fell in love! They are great for kids (and cheaper than a toy nativity set) and made from their heart. I set out in my mind that I would be making them as gifts for my nieces and nephew! These are the blocks I made as gifts (and of course I made an extra set for me!) 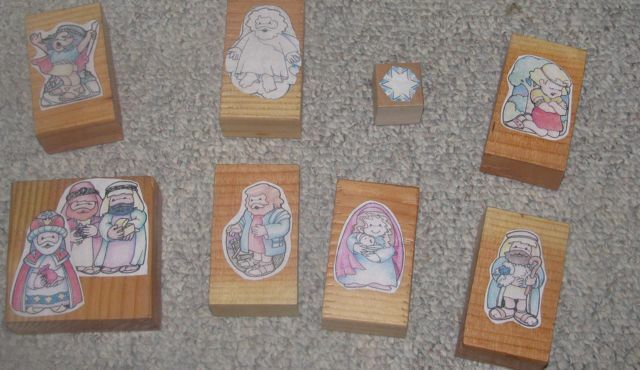 This is your more typical Nativity set… with Mary, Joseph, baby Jesus in a manger, donkey, stable, angel, star, innkeeper, shepard w/sheep, three wise men and a camel. I bought some 2X4 and 2X6 boards at a home improvement store, had them cut into blocks, sealed them, and then modge-podged the clipart on! 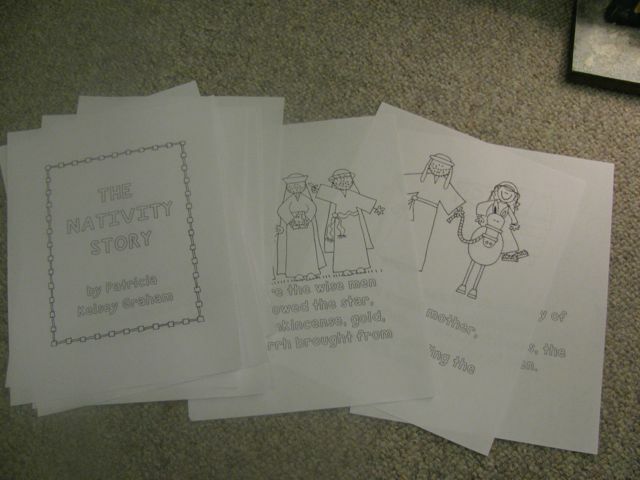 Since this is for little kiddos, I also created some coloring pages to go along with the blocks in their “Nativity Box”. (I also found a little story book to go in their box to complete the Nativity learning time fun!) I can’t wait to give these Nativity Boxes to some of the CUTEST kids I know!!! 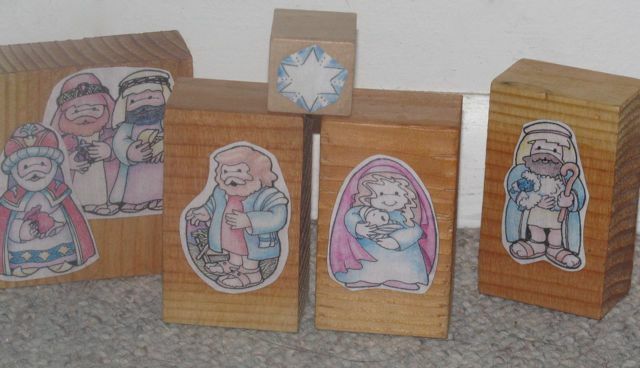 This entry was posted in celebrations, homemade gifts and tagged christmas, nativity on November 28, 2009 by ktoponce. The first project is a No Sew Blanket. I read about it on Izzie, Mac, & Me’s site. It seemed EASY enough for me to handle! 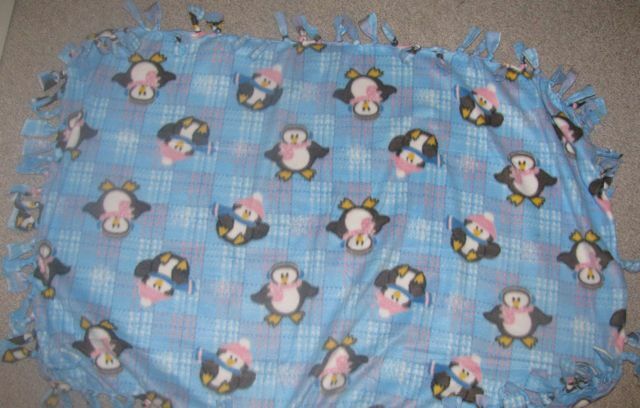 I made this for my daughter’s “squishy present”- you know how most kiddos open pajamas Christmas Eve, well we have been blessed to get a few different sets of Santa jammies as hand-me downs, so I opted for a winter blanket instead! 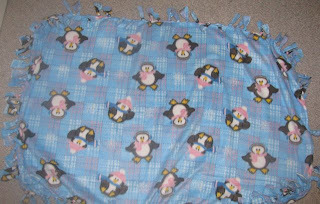 This was VERY cheap to make- this fleece was a remnant at the fabric store. I really lucked out! I love Christmas and homemade gifts are lots of fun to make! This entry was posted in celebrations, homemade gifts on November 28, 2009 by ktoponce.